I’m excited to share with you the upcoming release from my author friend, Brandy Bruce. I was fortunate to have the opportunity to read After the Rain last year, and not have to wait until February to read the sequel to The Last Summer. Check out Brandy’s guest blog post for The Last Summer on Inspy Romance here. After the Rain is Brandy Bruce’s highly anticipated sequel to The Last Summer. A brilliant standalone novel that will tug on your heart strings and inspire you to cheer for Debra. I do recommend reading The Last Summer first. The opening scene in After the Rain will hit you harder with more emotional impact if you’ve experienced what happened to Debra Hart in The Last Summer. From the opening line in After the Rain, you’ll immediately empathize with Debra and her situation. After the Rain is Debra’s story, written in first person point of view. Life is unfair and Debra has learned this universal truth the hard way. She has left Texas behind and moved to Denver to start a new life. She was devastated by her recent breakup with her boyfriend, Luke. He dumped Debra and started dating Sara, her now ex-best friend. Luke and Sara’s betrayal cut deep, and Debra has a new wariness around people. She fears being hurt and rejected. The difficult breakup precipitated a faith crisis in Debra’s life. She’s determined to protect her bruised and lonely heart from a God who she believes has abandoned her. Debra has walked away from God and the church. Her previous love for music and singing worship songs is dead. She’s not hearing the music anymore. Debra is lonely and she misses hanging out with her perfect circle of close friends in Houston. She resents being the one who had to leave. Luke and Sara have won, and she’s left on her own to pick up the pieces. Debra co-hosts a morning radio show in Denver, and her bitterness over the breakup leads her to create the radio persona ‘Miss Lonely Heart’. Debra takes calls from listeners with her co-host, Andy, and she dishes out relationship advice. Paige is Debra’s one and only friend in Denver. At the start of the story, Paige convinces Debra to go out with her and her friends to see a local band. Ben Price is the lead singer of the band and the worship pastor at Paige’s church. He was born to be a rock star. Debra is captivated by Ben’s performance on stage and she’s drawn to him, despite all of her emotional baggage. His incredible voice reaches out to Debra, touching that vulnerable place deep inside. Ben has secrets of his own. We experience Debra’s intense emotional highs and lows as Ben challenges her to take risks and tear down the fortress around her heart. A fun and compelling romance develops between Debra and Ben in the gorgeous Colorado mountain setting. Their relationship inspires both of them to question their priorities and chase their dreams. We journey with Debra on her roller coaster ride to overcoming her fears and opening her heart to faith and love and new adventures. I loved reading After the Rain. I read it quickly because I had to keep turning the page to see what would happen next. I highly recommend After the Rain to readers who are looking for a fun and engaging romance with deep emotional layers that will challenge them to consider the big questions in life. Many thanks to Brandy Bruce for providing an advanced reader copy. 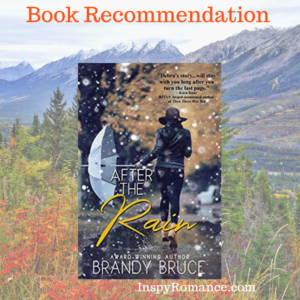 Brandy is kindly offering an eBook copy of After the Rain to a reader who comments on this post. The giveaway will close on January 28, and the winner announced in the next Sunday Edition. After the Rain releases on February 4, 2019. Learn more about Brandy and her books at her website. Colorado and the Rocky Mountains are on my travel wish list. Are there any places you’ve been inspired to visit, or daydream about visiting, after reading a book? Hi Narelle, thanks for sharing, Brandy is a new author to me so I look forward to checking her books out. PS, did you feel the earthquake last week? Heard about it on the news and straight away thought of our many visits to Canberra. Keep cool. Hi Wemble, I hope you’ll have a chance to check out Brandy’s books. It’s fun traveling to new places via books. I didn’t notice the earthquake but it may explain why the small crack in our ceiling skirting became larger on Friday. Hi Narelle! Brandy is a new author to me. Last summer after reading the Tuscany Legacy series, I would love visiting the Italian vineyards to see how they compare to our Michigan vineyards or the German Rhine River valley vineyards. As a retiree, I am an armchair traveler through my reading. While I enjoy the four seasons of Michigan, I love reading about winter activities. Today it is -4 degrees Fahrenheit. The coldest this winter. My grandchildren do not have school – it is Martin Luther King Day. Their father is in China on business and their mother works, so I dread leaving the warmth of my home to go to their house. We were spoiled this year with unusual warm temperatures. Best wishes. Hi Renate, Tuscany and the European vineyards is on my travel wish list, too! I hope you’ll have a chance to read Brandy’s books. Thanks so much for sharing your friend with us! I am always dreaming about visiting the places I read about… unfortunately most of them are fictional, lol. As for a real place I would love to see….Tuscany would be high on my list, so having read the series A Tuscan Legacy was truly fun! Those fictional towns would be Bridgeview and Green Acres, by the way – thanks to Valerie Comer!! Both of these books sound excellent. I still haven’t read the first one but I’ve set myself a reminder to read it on 2/3 so it’ll be fresh on my mind for the release of After the Rain. Yes! Pepper Basham’s Laurel’s Dream has made me want to visit the Blue Ridge Mountains! I keep hearing good things about this book too! Thanks for sharing about Brandy’s books. She is an author that is new to me and I look forward to checking out her books. Books always make me want to travel. Especially to Europe. I’ve been to Colorado and the Rocky Mountains, years ago, when I was still living at home. Reading takes me places I can only dream about going but can’t afford too. I loved The Last Summer! It was my favorite book of the year. So I can’t wait to read Debra’s story! And yes, I’ve wanted to visit Seattle, the Blue Ridge Mountains, Nantucket, Denver and Maine because of the descriptions in books! Thanks for the giveaway! Narelle, Thank you SO much for this review! Truly, your words mean so much to me. Hi Brandy, You’re very welcome :) I love your books!